Repoussé refers to decoration hammered into relief from the back of a metal plate. In this gold repoussé plaque, the Hindu god Vishnu represents the world axis. He stands on a square base, symbolic of the earth, and he is framed by a circular halo, which signifies the heavens. His upright form represents a stalk from which a lotus flower blossoms, seen at the top of Vishnu’s miter. Vishnu’s four arms, holding his attributes—the chakra (wheel), conch shell, orb and club—signal the four cardinal directions. 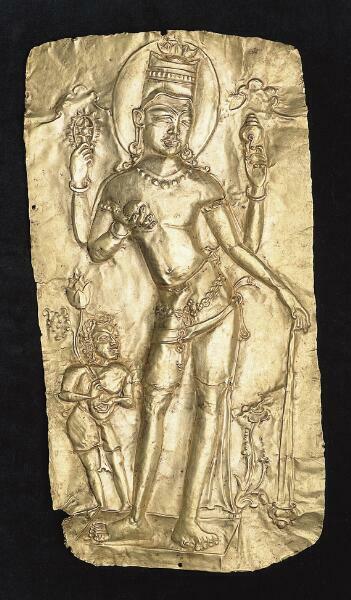 A number of striking gold plaques excavated in Thailand picture both Hindu and Buddhist deities. Such plaques are made by a process called repoussé, with the design hammered out from the back. Here, the hammering has created ripples around the image. Such plaques were used by both Hindus and Buddhists in the foundations of structures, where they were believed to bring protection and stability. This Hindu gold plaque from about 700 A.D. is important because of its unusually large size, and because it pictures a type of Vishnu that has only survived in fragments. The god is easily identified by the conch, wheel, globe and club in his hands. Stylized clouds around his head suggest his height—he is a towering link between the earth and the sky. The skilled foreshortening of Vishnu’s feet and pedestal create a strong illusion of depth. What is most curious about this plaque, however, is the small, lively figure who stands in awe beside him. He sways back from the god, as if to get a better look, and carries two lotus-like flowers. He may be an attendant, or possibly a personification of the lotus. You’ll find other smaller gold plaques nearby. (Pause) The most striking, at the bottom, depicts the moon god, with the moon rising behind his head like a halo. (Pause) Leaping across the moon is a large hare. In Asia, the spots on the moon are often compared to a hare, but this is one of only two known representations of the hare on the moon from South or Southeast Asia.